Query: Shall we find something to kill to cheer ourselves up? We have a few bug fixes in today's patch, and I have some information to share about the content of our first DLC, which is in the works. As always, your feedback and suggestions are important to us. Keep them coming! Fix for an issue in some of the game's random number generators, which was causing some native races (such as Threshers and Tinkers) to be unusually rare on some map sizes. All native races should now spawn at the intended rates. Morale reports for planets that have been lost should now be correctly removed from the notification list, rather than causing exceptions. The instant refit feature should now correctly trigger the "Harder Faster Better Stronger" achievement. We've started work on our first DLC expansion. We'll talk more about the features and schedule in the coming weeks, but for now I'll introduce you to a new playable faction in the expansion: the Tinkers. The Tinkers are a race of cyborgs who toil at the command of Dzibix, a megamachine which has spread across the majority of their arid homeworld of the same name. It's not known to outsiders whether Dzibix is some kind of precursor relic, or just a machine god that the Tinkers invented. It's not all that clear whether the Tinkers know the truth themselves, but they take its prime directives very seriously: Augment! Toil! Expand! And to better serve their machine god, they have made themselves into a cybernetic civilization. The Tinkers are not one of the Elder Races that took part in the Great War, but in their zeal to obey Dzibix's directive to expand, the Tinkers attempted to establish extrasolar colonies long before the restoration of the warp-lanes by attaching engines to asteroids and comets and converting them into slower-than-light colony vessels. Most of these outposts failed, and their remnants can be (rarely) encountered in the current game. 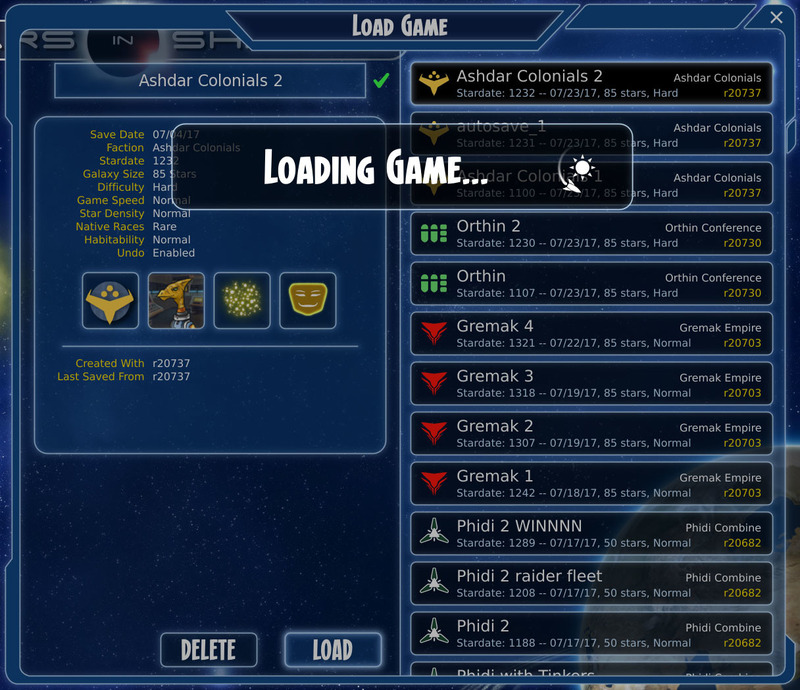 The expansion will allow you to take control of the Tinkers homeworld of Dzibix itself. Tinkers prefer arid environments that do not interfere with the machinery of their cities which sprawl across the landscape; water is an unwelcome obstacle to them. This intense industrialization ravages the environment of their colonies, but the Tinkers as cyborgs have reduced their need for food and the produce of nature. Having largely abandoned their natural life cycle, Tinkers reproduce slowly unless production is specifically allocated to this purpose. In harmony with their machine bodies and the orderly society it affords them, Tinkers do not know sadness or unrest; only duty. As befits a cyborg society, the Tinkers are superb engineers. Although their ordered machine society does not always come up with the most creative new technologies, they excel at advanced production techniques, miniaturization and repair. Their vessels are ruggedly armored and equipped with mobile fabrication systems which allow for rapid repair of damage and replacement of expended ordnance. Accordingly, Tinker ships are typically armed with smart missiles and automated fighters -- which, to the Tinkers, are essentially the same thing. That's all we have for now. Stay tuned! Did you hear that, meatbag? I'LL BE BACK! With infinite complacency, men went to and fro over this globe about their little affairs, serene in their assurance of their empire over matter. No one gave a thought to the older worlds of space as sources of human danger, or thought of them only to dismiss the idea of life upon them as impossible or improbable. Yet across the gulf of space, minds that are to our minds as ours are to those of the beasts that perish, intellects vast and cool and unsympathetic, regarded this earth with envious eyes, and slowly and surely drew their plans against us. Work continues on our first DLC, which we will have a formal announcement for in a few weeks. In addition to some balance tweaks, today's patch includes a variety of low-level infrastructure changes. In particular, we have made modifications to the graphics engine to improve performance when loading or processing turns, so if you notice some graphical glitches, please let us know. As always, your feedback and suggestions are important to us. Keep them coming! Revamped the Loading and AI Turns wait animations, and made changes to the graphics library so that star/planet/map animations will continue in the background (instead of freezing) during wait times. Increased the base resource yields of most alien native populations. Reduced the cost of Bombers by one-third. Increased the cost of Strike Fighters and added Antimatter as a prerequisite for the Multirole Fighters tech. Increased the cost of Heavy Railguns and halved damage. Deflector screens now absorb 50% of kinetic weapons damage, while Battle shields now absorb 70%. Decreased the damage of Neutron Beams. Ashdar Colonials fighter squadrons now have one additional fighter per Hangar module. Increased the damage of Pulson Launchers from 35 to 50. The technology 'Energy Torpedoes' is now called 'Plasma Projectiles' and requires Plasma Focusing. Increased the research costs of all late game technologies. Adjusted the wording in various resource descriptions to help clarify the distinction between the resource names (Labor, Science, Coin, Metal, Food) and the associated activities (Production, Research, Trading, Mining, Farming). Fixed a bug in the tactical weapon selection UI that prevented the first item in a ship's weapon list from being consistently selected when selecting a ship. Fixed a glitch in the planet farming/food description text. Fixed a few description text errors. Added new UI scaling rules for very high resolution monitors, and changes to avoid blurriness on high DPI monitors. Made improvements to GoG Galaxy achievement/stat error handling. Updated the Visual Studio runtime libraries to the 2017 versions. The 'simplified graphics' rendering mode is now enabled by default for all Intel HD 3000 and Radeon HD 7800 Series cards. By the toll of a billion deaths man has bought his birthright of the earth, and it is his against all comers; it would still be his were the Martians ten times as mighty as they are. For neither do men live nor die in vain. Our first DLC, Legacies, has been formally announced. For more info, check below the patch notes. Today's patch includes a number of economic balance changes, and adds zoom levels to the tech tree. 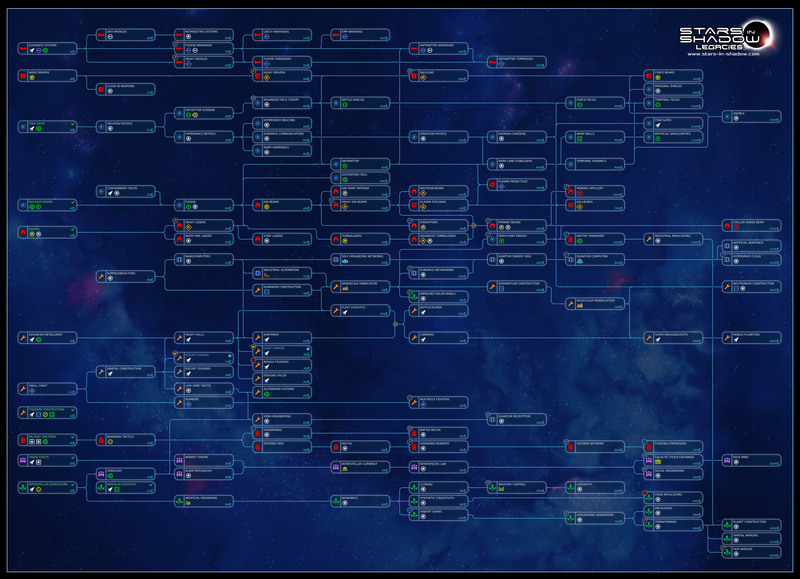 A full map of the tech tree can be found here (3 MB). As always, your feedback and suggestions are important to us. Keep them coming! The technology tree view now has two additional zoom levels. Use the new zoom icon at upper right or the mousewheel to change zoom levels. 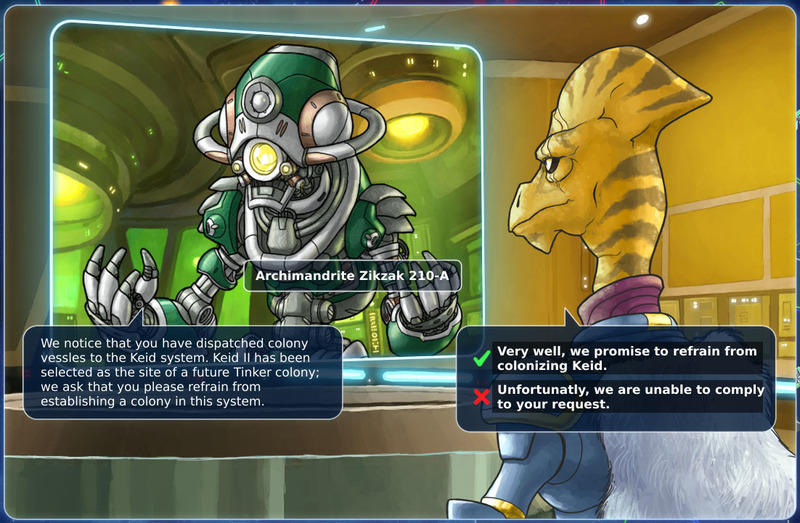 Phidi, Algorians and Pell now have the 'Friendly' racial trait, which eliminates the "Alien Rulers" morale penalty. The shipbuilding cost discount provided by Shipyards no longer stacks (more than one Shipyard at a particular colony will provide no additional discount). Surplus food is now converted to coins at a rate of 1/4 (rounded down). Upkeep costs for all ground units have been halved. Upkeep costs for most ships have been increased. Upkeep costs for planet defenses greater than level 1 have been increased. Mercenary upkeep costs are now visible in the mercenary hire overlay. Ground unit upkeeps now appear as a seperate item in the economic on-hover text. 'Subspace Networking' now reduces shipbuilding Labor costs by 25%, down from 50%. Made tweaks to the DLL loading process to attempt to fix the "debug.dll too old" issue. Fix for a bug that was causing Tinkers and Androids to suffer the 'Alien Rulers' morale penalty. Opening and closing the tech pane should no longer reset the currently selected tech. The Legacies DLC is targeted for release on both Steam and GoG.com in September. It includes a new playable faction (The Tinkers), a new minor faction (The Arda Seed), and a number of new features. Little is known about the details of why the Great War was fought, and who was on which side, but it is clear that even the great technological prowess of the Ashdar and Gremak of the Golden Age was insufficient to prevent the collapse of the warp lanes, which were created by a civilization even more ancient and more advanced than they were. The legends speak of a culture known as the Arda, who dwell in the depths of hyperspace and who were responsible for the creation of the hyperspace network that made warp travel possible. For whatever reason, it seems that the Arda abandoned the combatants of the Great War and either allowed the destruction of the warp lanes, or, perhaps, deliberately caused the destruction of the warp lanes, ending the war and leading to the fall of the civilizations of the Golden Age. However, three thousand years later, the warp lanes have abruptly and unexpectedly become reactivated. The reborn civilizations of the galaxy do not understand why they are now able to return to the stars, but they are about to find out. In the depths of hyperspace, there is an ecosystem of autonomous, self-replicating biomechanical entities created by the Arda for the purpose of maintaining the infrastructure of the hyperspace network. Slowly, over the millennia since the Great War, this Seed of the Arda has been reconstituting itself, and repairing and restoring the mechanisms that make the warp lanes functional. To continue this work, they have had to make forays out of hyperspace into the galaxy in order to collect important resources. In the current game, the player has already encountered low-level agents of this ecosystem in the form of the troublesome Star Harpies. As the player learns more about the source of these pests, they will encounter even more dangerous entities who can be formidable foes or helpful (but demanding) allies, depending on how the player chooses to deal with them. 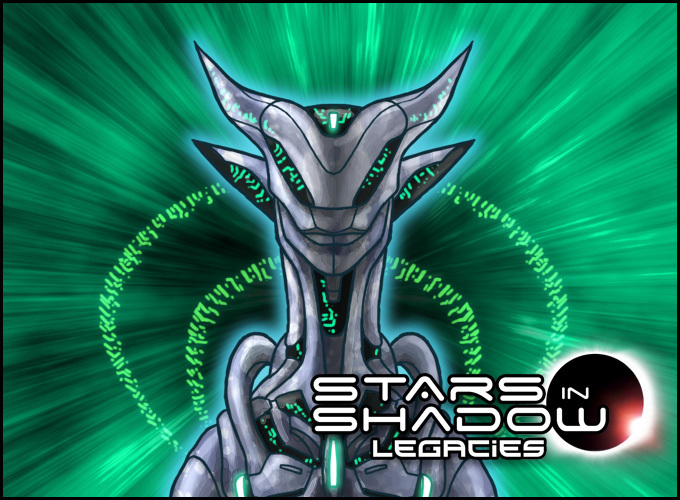 The Star Harpies in the current game are agents of the Arda Seed, collecting resources needed to further their mission to repair and expand the hyperspace network. The Harpies and other, more powerful Seed units operate from hidden Warp Nodes, which are planet-like objects embedded in hyperspace, and which allow the operation of the warp lanes. The units of the Seed are mindless automatons, which will attack anyone who interferes with their activities. In the early game, the Seed units function primarily as space monsters. Learning about the Seed and investigating where they come from can not only eliminate the threat of attacks from these space monsters, but can potentially earn great benefits in science and the practical use of the hyperspace network. The Arda Seed faction represents the next step in uncovering the story of the causes behind the Great War, which will continue to be expanded upon in upcoming expansions. 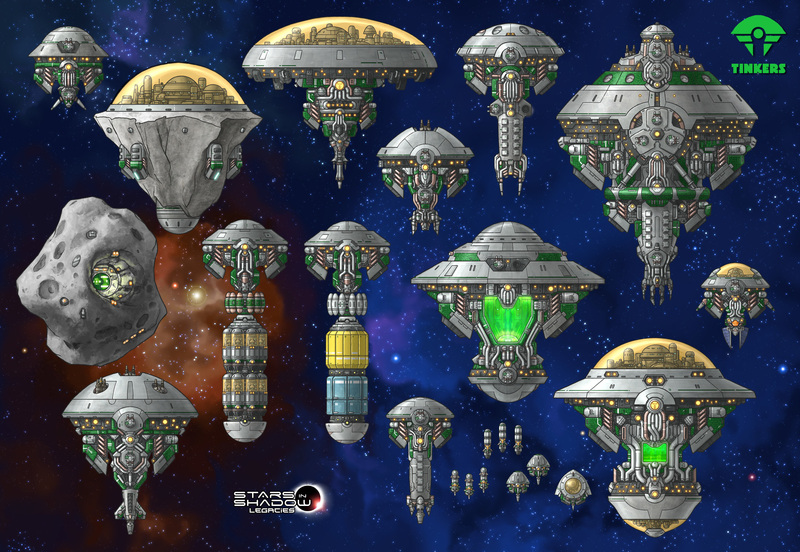 The Arda Seed will employ a number of new starship and station types, and make special use of several new gameplay features. A Hyperspace Anomaly is a bubble of real space-time trapped in hyperspace. It acts as a star system in game terms, usually with one “planet” (the Warp Node). Ships can travel to and from the Hyperspace Anomaly as if it were a star system, if the owning faction has the proper sensor technologies; otherwise, they are invisible on the map. A Warp Node is a construct created by the Arda (and their servants), that is part of the infrastructure of the Hyperspace Network that allows the Warp Lanes to function. It behaves like an uninhabitable planet (like a gas giant), but can support orbital infrastructure. Codices are tradeable items which provide a tech boost for a specific technology. They can be looted from derelicts, traded from allied factions, or purchased from the Herald. Artifacts are tradeable items that, when researched, provide benefits such as a tech boost, a unique technology unlock, or other special ability. Like codices, artifacts can be looted from derelicts, traded from allied factions, or purchased from the Herald. Although most of the Arda Seed units are mindless automatons, there is an intelligence of sorts at work behind them. Players will be able to encounter and negotiate with “The Herald,” a virtual entity who speaks on behalf of the Seed and who will trade information for the resources which they need to conduct their activities. The Herald travels throughout the galaxy, and can provide a friendly faction with information about the state of their rivals. Players who gain sufficient influence with the Arda Seed will no longer be automatically attacked by their minions, but beware: the goals of the Arda Seed go far beyond simple repair of the warp lanes, and the Herald will be a demanding ally. On the other hand, the Seed’s warp nodes contain treasure troves of ancient information for those bold enough to plunder them and brave the consequences. That's all for now. See you again soon. We are a bit behind schedule in our work on the Legacies expansion. Naturally, it's important to us to release a DLC that meets your expectations (and our own), and so we have pushed the release date of the DLC to October to allow enough time to get things right. For more info on the DLC, check below the patch notes. However, we do have some changes ready that we'd like to put into the field, and so we are pushing a patch today with some fixes and a few additions. As always, your feedback and suggestions are important to us. Keep them coming! Added a choice of Map Shape options (Box, Ring, Hourglass, Ellipse) to the Advanced Map Settings pane when creating a new game. Added a number of new UI sound effects including: load/save game complete, colony founded, planet special discovery, war declaration, enslave, liberate, forced labor, experiments, and galaxy creation complete. Added a 'Right Click Close' UI option to the Options pane. 'B' now acts as a hotkey for buying production on the currently selected planet. There is now a "Hail Fleet" option that adds a diplomatic option when your fleet intercepts an alien colony ship attempting to land in the same system. AI factions will now accepts trades for some resources, provided that a fair offer is made. Hiring mercenaries now costs influence, in addition to coins. The influence cost of securing a peace treaty will now vary depending on how the other faction feels the war has been going. All factions now receive 1 influence per turn if they have any contact with alien factions. When initially researched, Markets now increase trade capacity by 2 each (up from 0). Changed AI handling of three+ sided conflicts, should fix logic errors in AI code. Reduced the frequency of several types of planet disaster events. Fix for a formatting error when trading with marauder companies. Made several Low-level changes intended to work around problems with the latest AMD drivers. In windowed mode, window resizing cursors should now appear when appropriate. Altered the deficit handling rules -- forced scrapping now always yields some coin return. Adjusted planet autobuild logic to favor Trade in situations where deficits are imminent. AI players should now build more Markets during the late game. Fix for a bug that could cause re-contacted empires to respond as if you'd just meet. The Legacies DLC release has been delayed to October. It includes a new playable faction (The Tinkers), a new minor faction (The Arda Seed), and a number of new related features. In their zeal to serve their world-spanning megamachine master, the Tinkers have remade themselves as a cyborg species, part organism and part machine. The transformation is psychological as well as physical; Tinkers live in harmony without emotion, immune to the effects of morale as long as they are connected to the collective through their Machine Altars. To join the collective of the Tinkers' machine god Dzibix, one undergoes the process of Harmonization, which both converts the organism into a cyborg and establishes a neural connection to the collective. The Tinkers themselves undergo this procedure at birth, and it has become a crucial part of their life cycle: they are no longer capable of reproducing without it. Alien populations can also be Harmonized, if in the presence of a Machine Altar and sufficient Martial Law force (to prevent anyone from having second thoughts about the process). Harmonized populations become immune to morale effects as long as they remain in the presence of s Machine Altar, and can be used for Forced Labor or Experiments without penalty. The cyborg versions of most species gain in Labor output, but suffer reduced Science yield. The daily lives of the Tinkers are centered around their Machine Altars, which are a Tinkers-specific variant of the Factory. Machine Altars serve both as a place of work and as a medium of connection to the collective. Tinkers who are transported to a planet without a Machine Altar will become Disconnected, remaining immune to morale but suffering a -1 penalty to Labor output. When Harmonized alien populations become Disconnected, however, they again become susceptible to morale penalties, and may become discontent or revolt as with normal colonists. The Harmonization process can be reversed in alien populations, provided that the appropriate technologies are researched. De-Harmonized colonists return to normal, though they retain any morale modifiers that might have been previously masked by their Harmonized condition. Tinkers cannot be de-Harmonized; they have been living as cyborgs for so long that they are no longer capable of existing without their machine halves. That's all for now! See you in October. Do not be alarmed, leader of Humanity. This herald arrives on a mission without violence. Human vessels now delve deeper into hyperspace than ever before. The symmetry is disturbed. It is at this time that we who dwell in hyperspace must come to the surface and impart, and convey… and perhaps interact. The Stars in Shadow: LEGACIES DLC is available today, and accompanying it is a patch to the base game with a number of new features and changes. For more details about the LEGACIES DLC additions, see below the patch notes. We are always eager to listen to your feedback and suggestions, so don't hesitate to share your thoughts with us. The Tinkers faction has been added to the game, and is available as an opponent faction. The Legacies DLC is required to play as the Tinkers. Hyperspace Anomalies have been added to the map; they are hidden until revealed by the appropriate technology. Beware: they are a source of strange alien activity! Upon researching the Hyperspace Anomalies technology, those with the Legacies DLC will have an opportunity to interact with a mysterious alien entity known as "The Herald." The Space Habitat is a new station component unlocked by a new technology of the same name. Each Space Habitat can house one unit of population, effectively increasing the maximum population of the colony by 1. A station or outpost with a Space Habitat in orbit around an unclaimed planet will give the owning player control of that planet as if it were a colony. A few planets now have the Debris Ring special. This allows the construction of Asteroid Stations (with the appropriate technology), which are cheaper and better protected than normal Space Stations. Huge maps now default to 8 players (up from 7). Planet spawn rates have been altered -- small/fringe worlds of all types are now less common. Tiny planets will now spawn in new maps -- tiny planets cannot be colonized. Ships with functioning Autorepair or Tinkers Forge systems will automatically be fully repaired at the end of combat. Outposts can now provide repair and refit facilities to visiting fleets if equipped with a Construction Module. Fix for a bug in the in-game docs for planet food production. Fix for a bug that could be triggered by trying to delete a game when the sound effect volume was set to 0. Fix for a bug that was causing the AI to inappropriately favor shipyards over armed stations. Fix for a bug that was allowing outposts without fuel depots to serve as fuel bases. Successfully rebellions will now destroy all orbital infrastructure. Double-clicking on a save in the Load pane will now load the selected game. Fix for a bug in the Tinkers' mercenary exchange. Reduced the number of Marauder companies generated in new maps. Workaround for a tech-line rendering bug present on older Intel laptops. Fix for a bug that could occur when negotiating to end a war with Marauders. The long range weapon mod now correctly increases range to 150%, as per it's description. The Legacies DLC is also available today. It includes a new playable faction (The Tinkers), a new minor faction (The Arda Seed), and a number of new related features. The Tinkers are a cyborg civilization dedicated to the service of a machine god. Tinkers prefer arid climates and require little food, but reproduce slowly unless they spend metal to manufacture new population. Tinkers vessels have a built-in Forge system, which both repairs the ship during combat and replaces expended ammunition and small craft. Tinkers are Harmonized, meaning they are connected to a collective, a network of minds. As long as they have access to this connection (provided by the Machine Altar, a Factory variant), Harmonized colonists are immune to morale effects and experience improved productivity. Alien colonist can also be Harmonized, but beware: if the connection to the collective is broken, the realization of what has happened to their bodies may be... disconcerting to them. The Tinkers homeworld has a new planetary special: Debris Ring. Planets with this special can construct Asteroid Stations, which are special versions of stations that have built-in extra armor systems (Chondrite Armor) and which have reduced costs to build, since they utilize existing natural structures. Tinkers can un-deploy stations/outposts and move them, to re-deploy at a new planet. This also applies to their asteroid stations. Moving outposts to extend ship range can be useful for early exploration, and mobile stations equipped with the new Space Habitats can claim neutral planets for the Tinkers' empire, even if they do not currently possess the environmental technology to put boots on the ground. The Arda Seed are hyperspace-dwelling biomechanical automatons who repair and maintain the infrastructure of the ancient warp lanes created by the mythical Arda, and who can be hostile to anyone who attempts to interfere with their work. However, there is a strange entity calling itself "The Herald" that appears to speak on behalf of this mysterious faction. A Hyperspace Anomaly is a bubble of real space-time trapped in hyperspace. Ships can travel to and from the Hyperspace Anomaly as if it were a star system, if the owning faction has the proper sensor technologies; otherwise, they are invisible on the map. Hyperspace anomalies and the Warp Nodes they contain are fiercely guarded by the forces of the Arda Seed. Although most of the Arda Seed units are mindless automatons, there is an intelligence of sorts at work behind them. Players will be able to encounter and negotiate with “The Herald,” a virtual entity who speaks on behalf of the Seed and who will trade information for the resources which they need to conduct their activities. Codices are tradeable items which provide a tech boost for a specific technology, or unlock new technologies. They can be looted from derelicts or purchased from the Herald. That's all for now! I will update the roadmap soon to let you know what we plan to do next. This herald now withdraws. Do not descend deeper into hyperspace than your surface kind is meant to dive. Do not defile the anomalies within the great dark. Leave their warp nodes undisturbed. Observe these warnings, and we may interact amicably and productively, another time. With new *expansion* comes new *bugs*, which makes us *frumple*. And so we offer *fixes* in this *patch*, and some new *juice*. If you are *campers* you will enjoy *the change*, but maybe not yet. We are *friends* now. Never be afraid to *open* enough and *spread the wax*. Let's *spitting* the fun words for several *pieces* and then surprising things!!! 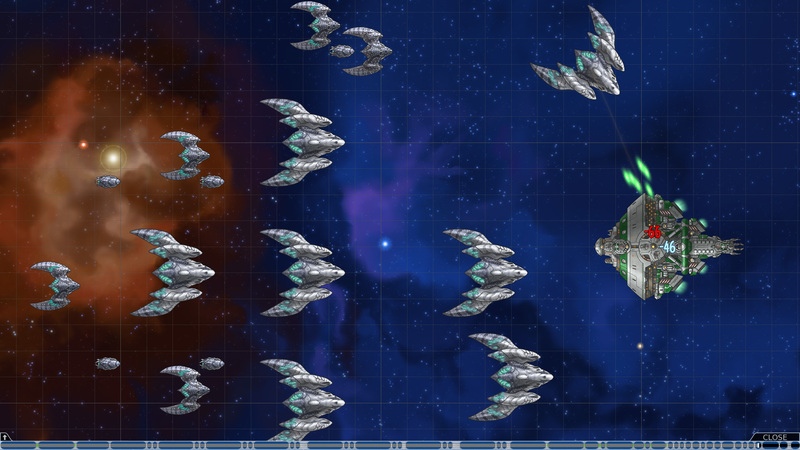 Added new tactical background art for battles at Hyperspace Anomalies. Added the "Herald" battlecruiser-class unit for the Arda Seed. The Herald will now use this instead of a Mediator. Changed the behavior of Star Harpy swarm events: swarms are reduced on Easy difficulty, and Harpies will not attack planets. Added several new Arda Seed-specific ship components. Updated background art for the Tinkers leaders. Bombers and Strike Fighters now carry regular missiles instead of torpedoes. When scrapping a factory on a colony that has both factories and machine altars, factories are always scrapped before machine altars. Mobile Bases and Asteroid Outposts now have specific description text. Fix for an error affecting certain Intel Iris graphics drivers. Fix for a rare bug that could be triggered by rendering certain text strings (Juggernaut bug). Fix for a display bug in the planet production info panes. Fix for a layout problem in the planet production info panes; long colonist names should no longer overlap resource yields. Fix for a bug that was preventing declaration of war notifications from appearing. Fixes for some in game text errors (missing tooltips, etc.). Fix for a bug that could be caused by allying with a player with access to hyperspace anomalies. Fix for a bug that could be caused by opening the fleet list pane while at a hyperspace anomaly. Fixed the on-click behaviors of the small icons in the agreement dialog panes. There is *juice squeezing* and then we are not so *frumple*. These are *fat* words. Do you want to play this some more? WE BRING GREETINGS FROM A FRIENDLY SPECIES. DO NOT FEAR. WE SHALL NOT HARM YOU. THIS IS PROBE 2418-B, ON A PEACEFUL MISSION. WE ARE NON-HOSTILE AND SEEK TO ESTABLISH FRIENDLY RELATIONS. WE WISH TO LEARN MORE ABOUT YOU. PLEASE TRANSMIT DATA. THIS PROBE IS NON-HOSTILE. DO NOT ATTACK. Added new units for the Arda Seed: the Steward, Engineer, and Harpy Nest. Arda Seed will now periodically reinforce, set up nests, and expand from systems they occupy. Added autopsy reports for the Proteans and all the new Arda Seed units. All Arda Seed units now have some inherent self-repair ability. The Ashdar missile cruiser now has torpedo, rather than missile, hardpoints. It is now possible to embark ground units to a Station equipped with assault shuttle bays. Building additional stations should no longer cause planets with Shipyards to lose their production discount. Technologies gained from the Herald or a derelict colony should now be correctly removed from the research queue. Fix for a bug that could prevent Star Harpy Autopsies from being awarded as intended. Fix for a rare bug that could cause stations to attempt to attack themselves. Missile hardpoints can no longer mount torpedoes. Fixes for some sound and animation glitches affecting the Herald and Mediator ships. Stations captured in tactical combat will now be destroyed at the end of the turn unless the planet they orbit is also captured. THIS PROBE IS PROGRAMMED TO DEFEND AGAINST HOSTILE BEHAVIOR. SURVIVAL SUB-SYSTEM ACTIVATED. WEAPONS ENGAGED. DEFENSE SYSTEM HAS BEEN ENGAGED. HOSTILITIES COMMENCE. Greetings, galactic despots! We hope you've had a triumphant holiday campaign season. Today's patch includes some expanded functionality for the Legacies features, including some new weapons and technologies. Next we will be working on improving some of the base game systems, including AI, diplomacy, tactical UI and victory conditions. As always, your feedback and suggestions are important to us, so keep them coming! The Herald of the Arda Seed now tracks faction reputation with the player. Completing peaceful trades with the Herald will increase reputation over time, while destruction of Arda Seed units or intrusions into Hyperspace Anomalies will decrease reputation. The roster of items which the Herald will offer for sale is also now dependent on reputation; more advanced items will require higher reputation. 'Pulse Generators' allows the player to build a version of the Steward Electrocyte shield/weapon system. 'Plasma Torpedoes' allows the player to build a torpedo version of the Protean. 'Arda Thrust Vanes' increases the tactical speed of all vessels. 'Arda Focusing Lens' unlocks a beam weapon modificiation that increases range. 'Arda Puzzle Box' improves morale of all colonists. 'Arda Persuasion Matrix' improves reputation with all foreign factions. 'Arda Fabrication Techniques' increases the Labor output of Factories. 'Core-Tap Mining' unlocks Tier 3 Mines. 'Warp Node Attunement' allows Hyperspace Anomalies to improve your fleets' range as if they were your own bases. 'Warp Node Dynamics' increases hyperspace speed and range. 'Harpy Repellant' prevents Arda Seed units from automatically attacking your fleets in real space. Some of these Codexes can also be looted from destroyed Arda Seed or Star Harpy units. The Herald of the Arda Seed now tracks reputation with the player's faction, and available purchases are now dependent on reputation level. Players may now purchase and discover Codexes, which unlock previously unavailable technologies for research. The Tinkers' Bomber has been replaced by the Vindicator, which is an expendable multiple-warhead manned missile which can be launched from torpedo hardpoints as well as hangars. Arda Seed Proteans will now use an offensive suicide attack after closing on enemy ships. Added five new achievments related to the Legacies DLC. The mining activity now provides +50% output per mine (up from +33%). Earthquake random events are now limited to destroying at most 2 improvements. Added the 'minerals discovery' random event. Added the 'artifacts discovery' random event. Increased Market Coin production from 4/7/12 to 5/10/15. Increased second and third tier Factory Labor production. Adjusted Dread Star production costs. Added a 'hostile environment' upkeep cost for colonies in harsh environments. This new mechanic is suppressed in any game started prior to r21718 so that it will not affect existing saves. AI empires should be less likely to choose to colonize hostile environment worlds. Marauder factions should be less hostile to AI empires. AI empires will now make use of outposts to extend range. Increased the planetary bombardment power of carriers. Fix for a rare bug that could be triggered when Harpy fleets returned to their source HSA. Losing a planet should now reliably resolve all pending construction complete warnings pertaining to that planet. Fix for a bug caused by unresolved attacks against fleets belonging to a defeated empire. Fixes for bugs that could be triggered by refitting ships while in the process of issuing a move order. Fix for a production display bug affecting planets with space habitats. I bid you a formal welcome, Captain. Today's patch contains a number of updates and tweaks to the base game, adds a new strategic territory overlay, and new functionality for the Orthin capacitors. As always, your feedback and suggestions are important to us, so keep them coming! As part of their mania for high energy physics, the deep-water dwelling Orthin have developed a unique high pressure metallurgy that allows for ultra high capacity energy transmission subsystems, enabling their vessels to mount unusually powerful beam weaponry. The elegant and elaborate cooling mechanism used by these high-pressure superconducting busbars takes up a significant amount of the ship's hull infrastructure, but also allows for the possibility of useful components being attached to this subsystem. The Shield Capacitor is the primary target for the busbar slot, and it provides additional tactical actions. Whenever a ship equipped with a Shield Capacitor takes shield damage, a portion of the energy is stored in the capacitor. This energy can be released at any time and used either to boost shields or overcharge weapons. The "SHIELD BOOST" and "OVERCHARGE" buttons in the tactical UI show the current charge of the capacitor. Clicking on either action will spend the current stored energy on the appropriate function. Once the capacitor is fully charged, no additional energy can be stored until the capacitor is discharged. SHIELD BOOST: applies the stored energy to reinforce shields. Damaged shields are restored up to the reinforcement amount. Reinforcement over the normal maximum shield strength lasts until the next turn. OVERCHARGE: diverts stored energy to the main weapons. Only affects direct fire weapons in the retractable forward hull slots and any siege hardpoints; does not affect missiles, fighters or point-defense weapons. The available energy is divided amongst the eligible weapon mounts. From the Ship Designer, select "New Design"
From the New Design list, select "Outpost Transport"
Done! The "Habitat Transport" will now be available in your build menu, in addition to the existing Outpost Transport (or any other custom versions you design). Note: be sure to embark colonists aboard a Space Habitat station before leaving! Already built Outpost Transports in older saves may not work, so you may need to scrap them and build new ones. Orthin ships equiped with Shield Capacitors now have access to the "Overcharge" and "Shield Boost" special abilities. Orthin players can now unlock the 'Power Converter' busbar component after researching 'Zero-Point Energy'. Colony ships can now colonize a planet if the colonists on board would be comfortable there, even if the owning faction's race would not. Editing an outpost transport design now edits the design of the created outpost. Outpost designs are no longer required to include a fuel depot. 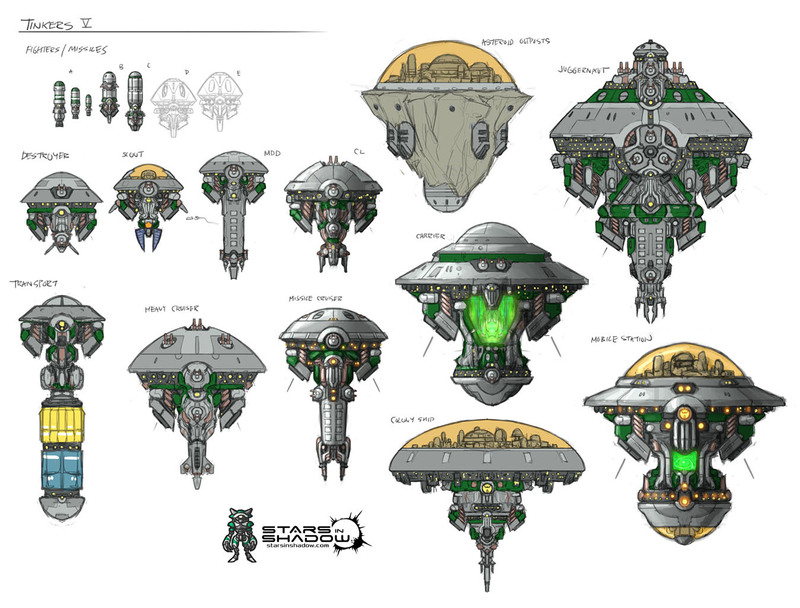 Outpost designs that include Space Habitats can now embark colonists prior to deployment. Outpost transports built in old saves will no longer function. Colonists in deployed Space Habitats now consume food. Viscid now have the 'vermin' trait, making them immune to starvation. The 'Energy Refocusing' technology is being retired, and will not appear in new games. Added the 'Supergrain Discovery' planetary event. Reduced the frequency of some Star Harpy events. The Phidi Torpedo destroyer, human Missile Cruiser, and human Battleship all now have 'Torpedo' rather than 'Missile' hardpoints. It is now possible to place 'Blast Doors' and 'Scanners' in a Heavy hardpoint. Added an empire territory overlay to the strategic map. It can be enabled or disabled with 'Show Empire Territory' in Options. The Empire Insignia displayed on the overlay can also be independently disabled. Fleet destination lines can now be disabled with 'Show Fleet Route Lines' in Options. Most options in the Map Settings screen now default to the values used in the most recent savegame. Replaced the 'Pirate Activity' advanced setting with 'Raider Activity', which now also controls the level of Star Harpy activity. A warning icon will now appear at systems blockaded by enemy ships. In tactical combat, +healed numbers will now appear when ships regenerate shields or armor. Clicking on a planet's special resource icon will now open the planet info entry for that resource. Clicking on a fleet's empire icon will now start a conversation with that empire, if possible. Fix for a tech tree bug that could be triggered by reverse engineering Fusion Torpedoes while playing as Orthin or Gremak. In the case that battle salvage unlocks techs that are impossible to research, the player will no longer receive a "tech unlocked" notification. Fix for a bug that could be triggered when Vindicators retarget on a new ship. Fix for a bug that was preventing the Shield Piercing abilities of the Force Lance from working as intended. Removed redudant post-battle 'technology unlocked' notifications. The components list should no longer show incorrect small craft graphics when designing planet defenses. The 'hail fleet' option should no longer appear when an empire you are at war with attempts to colonize a planet. It should no longer be possible for the food cost of City Planning to be negative. Fix for a game state maintenance bug affecting battles in which the right-click inhibit weapon fire toggle had been used. Well then, we bid you farewell. we won't hold our breath. Today's patch has been a long time in the making: it includes extensive changes to the AI and diplomacy system, difficulty level balance, and adds an oft-requested Victory screen, complete with a stat graphs display. As always, your feedback and suggestions are important to us, so keep them coming! 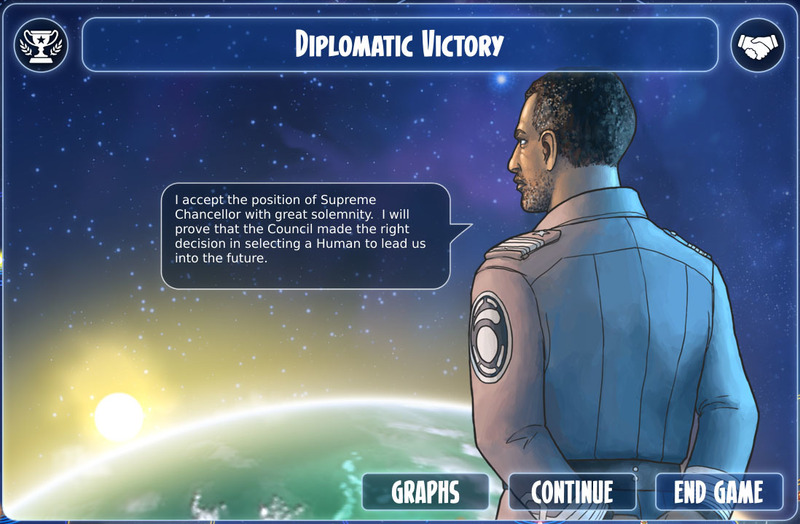 Upon achieving one of the victory conditions (Conquest, Diplomatic or Allied Victory), a Victory pane will become visible in the Diplomacy menu. This includes options to view a Graphs screen (with selectable displays to compare Population, Military Strength, Scientific Progress, Metal Production, Available Labor, Total Income, and Science Production), exit to main menu, or to continue playing. If the player chooses to continue playing, no further victory conditions will trigger. The artificial intelligence (AI) for the computer-controlled opponent factions has been substantially reworked. We have added a variety of new behaviors and diplomatic events. In particular, AI factions have more context-sensitive behavior regarding its friends and enemies; it can now more capably offer or request help from an ally, and it is more likely to take offense when one is friendly to its enemies. Since the AI opponents now play more effectively, we have also extensively tweaked the balance of the various difficulty levels, removing some bonuses that the AI received on "Normal" difficulty setting, and giving the player some extra bonuses on the "Easy" setting. Even so, players may find difficulty levels above "Easy" noticeably harder than prior to the patch. Changed balance and AI advantages on Normal, Hard, and Brutal settings. Players may find games on settings above "Easy" to be noticeably harder. The AI no longer receives resource bonuses on 'Normal' difficulty mode. The player now receives resource bonuses on 'Easy' modes. Torpedoes can now be placed in heavy hardpoints. Orthin and Gremak can now research Heavy Missiles. Strike fighters will now attack starships using beam weapons if their beam weapons are more powerful than their missiles. Significantly reduced the range of anti-missiles. Reduced marauder ship spawn rates. Reduced the strength of Marauder fleets. It is now possible to deploy outposts around planets you already control. Added several new diplomatic issues. Added the 'Expansion Request' event. Added the 'Trade War' event. Added the 'International Incident' event. Added the 'Wreckage Analyzed' event. Added the 'Technology Captured' event. Reduced the research cost of 'Defense Grid'. Increased many agreement influence costs. Increased upkeep costs for mid/late game ship hulls. Phidi no longer start without the 'Military Doctrine' technology. Changed the hiring cost formula of mercenaries; in most cases this is an increase. Decreased the spawn rates of mercenaries. Increased the cost of the 'Artificial Organisms' tech. Increased mid/late game strategic fleet speeds. Upgrading tanks no longer increases their build or upkeep costs. Increased the number of stars in 'small', 'normal', and 'huge' maps. Citizens from allied factions will now sometimes offer to join your empire. Allying with an alien faction now removes the "Alien Rulers" morale effect from colonists of their race in your empire. Increased the research cost of 'Battle Mechs'. Galactic council votes can now influence reputation. 'Graviton Physics' and 'Advanced Field Theory' now grant increased tactical speed. Increased mid/late game science boosts from experimenting on slaves. Reduced the number of technologies offered by the Herald. Updated mechanics for ancient data archives. Tinkers AIs should now make use of Asteroid Outposts. Changes to the random number generator used in planetary bombardment / invasions to improve the accuracy of the predicted outcome display. 'Artificial Sentience' now provides +15 science on all worlds instead of +1 improvement slot. 'Adaptive Energy Grid' now provides +10 labor on all worlds instead of +1 improvement slot. 'Social Engineering' now unlocks a varying number of improvement slots depending on planet size. The AI's ship building strategies should now reflect its research strategies, and vice versa. A variety of fixes and improvements in the AI's economic logic. A variety of fixes and improvements in the tactical combat AI. Significant changes to AI behaviors around starting and stopping wars. The AI should now be less likely to spam colony ships. Adjustments to the AI's handling of planet production changes. The AI should now pursue more varied research paths. The AI should now sometimes transfer population units between planets. AI's will now be more likely to cooperate with allies. AI's should now wait at least 15 turns between making peace and restarting a war. AI's may now demand that you stop trading with their enemies. AI's may now demand that you release their people from slavery. AI's may now issue ultimatums before starting a war. AI's may now insist that your fleets stay outside their territory. AI's may now request to start joint wars against third parties. AI's may now demand that you return control of colonies they have a historical claim to. AI's may now object if you establish colonies/outposts in their territory. AI's may demand control of splinter colonies founded by members of their own species. AI's may offer gifts to friendly players. Allies should now better cooperate when routing defensive fleets. Tweaks to the logic governing AI tactical retreats. Changes to the AIs "sue for peace" logic. Changes to formula used in resource request events. Added a Victory screen that includes a Graphs screen. Added an "Intelligence Briefing" option to the diplomacy screen which will display Graphs for known factions (hotkey Ctrl-G). Added a Credits pane to the Main Menu. Added various faction-specific weapon art assets. Updated the layout scheme for population icons in the planet information screen. Fix for a low level bug in the AI task dispatching logic. Added debugger hooks for VS Code. Fix for a bug involving intercepted AI transport fleets. Fix for a bug involving AI City Planning. Fix for a bug in the city planning food consumption logic. Fix for a bug caused by absorbing an empire that contained outposts. Fix for a star shader glitch affecting many cards using newer AMD drivers. Attempted workaround for a bug affecting ship designer part placement. Fix for a bug in the AIs handling of captured ships. Fix for a bug in the war/peace logic. Fix for a bug in the AI improvement selection logic. Fix for a bug caused by reverse engineering captured Tinker technologies. Fix for a bug involving ignored ship capture reports. Transferring control of planets will now also transfer control of all orbiting stations. Tinkers should no longer request food aid. Fix for a bug caused when one AI empire absorbs another. Fix for a bug in the "empire eliminated" report. Transfers of planetary ownership should no longer leave invalid "encounter" reports on the starmap. Fix for a bug caused when transports arrive at a planet that has changed allegiance. Annexing a planet will now reduce its planetary defense level to match what is permitted by your technology. We hope you enjoy these changes. Until next time: good luck, Emperor! Last month's patch was a big one, and so predictably there were bugs to hunt. Today's patch contains mostly bug fixes, and we also made some balance adjustments to the AI on "Easy" difficulty. As always, your feedback and suggestions are important to us, so keep them coming! AI-controlled factions now have an additional handicap when playing on the "Easy" difficulty level (ships cost additional Labor). The technology 'Cybernetic Organisms' is now available to all factions. This allows Harmonized population units to be De-Harmonized, and increases Battle Mech strength by +2. Unescorted transports carrying civilian colonists will now surrender to the enemy if attacked. Eliminating an empire by capturing its last outpost should no longer cause an error. Fix for a coin rounding issue in the resource request event. Fix for a bug triggered by battles that included fleeing population transports. Destroying a colony immediately after creating it should no longer cause an error. Fixes for several bugs involving invalid starvation warnings. Fixes for several "likely bug in the attack confirmation logic" warnings. Fixes for logic errors in the "please do not colonize" requests. Reverse engineering captured ships should no longer cause errors in the technology queue. Updated the logic used to determine resource request quantities to better take into account what the player can practically afford. Destroying a ship while it's being refitted should no longer cause an error. Transports arriving at an outpost planet should no longer cause an error. Colonist morale modifiers should now persist when populations are transported between worlds. Agreeing to embargo an empire you don't have a trade charter with should no longer cause an error. The unknown future rolls toward us. I face it, for the first time, with a sense of hope. Because if a machine can learn the value of human life, maybe we can too.